Kinesiology for the Occupational Therapy Assistant: Essential Components of Function and Movement, Second Edition approaches the study of kinesiology by connecting function to the underlying components that make movement possible. Jeremy Keough, Susan Sain, and Carolyn Roller present a text that makes learning and retaining information easier for students through application. A top-down approach, based on the AOTA’s Occupational Therapy Practice Framework, Third Edition is used to allow the student to see the big picture and then guides them to understand what fundamental kinesiological functions may be causing limitations or decreased engagement in daily activities. You will receive access to Goniometry and Manual Muscle Testing interactive learning tutorials FREE for 120 days with your new text purchase of Kinesiology for the Occupational Therapy Assistant, Second Edition. Watch the videos, read the text, listen to the experts explain the techniques—all at your own pace. 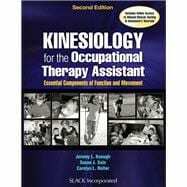 Kinesiology for the Occupational Therapy Assistant: Essential Components of Function and Movement, Second Edition provides students with thorough explanations and learning activities that will put kinesiology into context. Students will also gain insight into the practice of occupational therapy through directed questions and problem solving to assist the client in achieving movement goals. Jeremy L. Keough, MSOT, OTR/L, FAOTA, is currently a staff occupational therapist at Blount Memorial Hospital in Maryville, Tennessee. Jeremy earned his undergraduate degree in Occupational Therapy from Eastern Kentucky University and a post-professional master’s degree from Belmont University. His professional experiences include long-term care, inpatient rehabilitation, outpatient rehabilitation, work hardening, acute care, and occupational therapy assistant education. Jeremy has served as the Occupational Therapy Assistant Program Director at Roane State Community College, during which he instructed the kinesiology course. Currently, Jeremy’s interests include neurorehabilitation approaches, dementia care, functional movement, and volunteering for youth baseball programs and community veterans organizations. Susan J. Sain, MS, OTR/L, FAOTA, is currently a faculty member and academic fieldwork coordinator at Roane State Community College in Tennessee. Susan earned her undergraduate degree in Occupational Therapy from the University of Wisconsin at Madison along with a degree in Spanish. She later earned a master’s degree in Health Promotion/Health Education from the University of Tennessee at Knoxville. Her professional experiences include adult and child psychology, skilled nursing, pediatrics in a variety of settings, early intervention, and academia. Susan served as the program director of the occupational therapy assistant program at Roane State Community College for 11 years and has been the academic fieldwork coordinator for 9 years. Susan has instructed the kinesiology course for more than 17 years. Susan has served in a variety of volunteer positions for state associations, including the American Occupational Therapy Association and the National Board for Certification in Occupational Therapy. Her current interests include aging in place, environmental psychology, and universal design. Carolyn L. Roller, OTR/L, is an adjunct faculty member in the Occupational Therapy Assistant program at Roane State Community College in Oak Ridge, Tennessee. She also works pro re nata (PRN) as a hand therapist in several clinics in the Knoxville, Tennessee area. Carolyn earned her undergraduate degree in Occupational Therapy from the University of Wisconsin at Milwaukee. Her professional experiences include outpatient rehabilitation, home and job site analysis, ergonomic considerations in the wellness community, and occupational therapy assistant education. Carolyn was an adjunct faculty member at South College in Knoxville, Tennessee, teaching kinesiology in the occupational therapy assistant program and prevention of hand injuries in the wellness community.